All photos provided by B Sweet Designs. This is a partner post. This post requires a little bit of audience participation. Imagine a lavish table with beautiful linens. On this table are hundreds of the most gorgeous and yummy pieces of dessert that you've ever seen. All types of sweets, from cookies to cupcakes to French macarons and everything in between. These confections are flocked with delicate and intricate servingware and very special details to tie the entire table together. Sounds like a dream? Now it's a reality, thanks to Marisa Battaglia of B Sweet Designs, who specializes in creating unforgettable dessert tables for weddings and special events. Marisa designs these tables herself and works with Western New York's top bakeries to bring you the most delicious works of art that you've ever seen. Recently, I sat down with Marisa to talk about B Sweet Designs, and after our little chat, I think I'm now going to throw a party just so I can hire her to create a custom dessert table for me. How B Sweet Designs came about: B Sweet Designs officially became a business in November 2015, after Marisa and her husband, both Buffalo natives, got married at a winery up in our neighbor to the North, Niagara-on-the-Lake. For their wedding, she had hired a professional company in that area to create a dessert table for her, and she thought if she had gotten married in Buffalo, she wouldn't have had access to this since there was no one doing this locally. She felt so passionate about the art of dessert table design, so she decided to start her own business here in Buffalo. “People spend so much time, so much effort, and so many resources putting together an amazing event, so why not have a dessert table at the end to give your guests the sweetest send off? It's the perfect way to make sure that your event is going to be really memorable,” she says. You know how Buffalo is known as the "City of Good Neighbors?" Well, Marisa really speaks on the truthfulness of that statement. Her business allows her to partner up with many local small business owners. It's not only a collaboration with bakeries, but also artists and florists. They get to come together and work on a beautiful table for people who really want that special sweet touch. Her passion for dessert and design: Marisa has always had a sweet tooth. "I LOVE dessert," she says. "Chocolate all day." She went to school for marketing and had worked in the corporate world for a while. She learned a lot throughout her career, but what she learned most is that she really enjoys the creative part of marketing. She confessed that she is a bit of a free spirit, so the perfect job to her would be something where she could let her creativity shine and not have to explain her "crazy" ideas. After she had gotten married and noticed that there wasn't any type of businesses specializing in dessert table design in Western New York, she just went for it. B Sweet Designs blended her two loves of dessert and design. On her favorite dessert: "Without a doubt, anything salted caramel. I live for it." 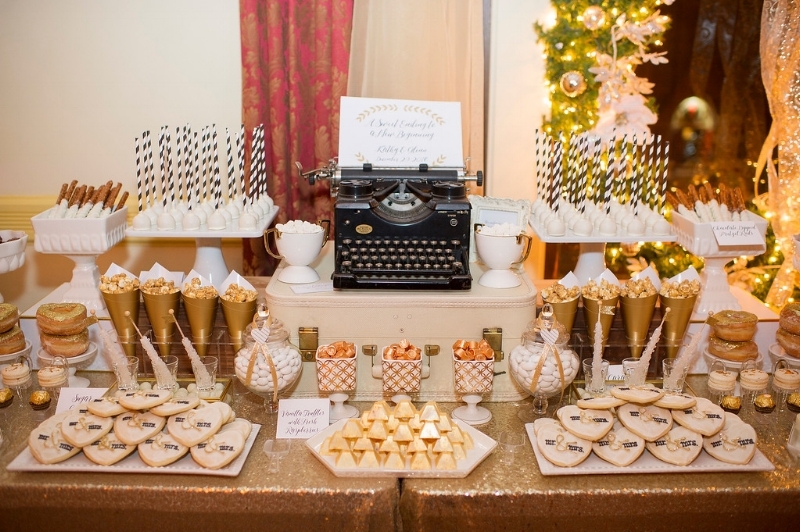 She also adds that sweet and salty combinations are always great when you're enjoying a cocktail, so salted caramel treats or chocolate covered pretzels are always a crowd pleaser for her dessert tables. They satisfy the sweet tooth but also have the saltiness that people crave when they are having a little bit of fun at a party. Her most requested dessert for the tables: Generally, when she meets with people, there are one or two dessert items they absolutely love and HAVE to have on their table, and Marisa can usually accommodate most requests. Chocolate covered Oreos are a big hit (and rightfully so, because come on, they are delicious.) She also loves to provide custom treats that are unique to her tables, like glitter doughnuts or pyramid truffles. “The best part about dessert tables is you don’t have to choose just one or two dessert items. You usually get anywhere from eight to ten varieties,” she says. Since every dessert item is custom designed for each specific dessert table, she doesn’t have a set list of desserts to choose from because the options are based on preference and are nearly endless. As an added bonus, a few of the desserts that Marisa can provide on her tables are naturally gluten free, such as French macarons, which are made with almond flour. Also, she can provide several chocolate items, such as candy or truffles, that do not contain any gluten, and she’s created custom gluten free dessert items by request. This way, if there are guests at your event who have to eat gluten free, they won't have to worry that there will not be any options available. They can have a real dessert. What she loves most about owning her own business: Even though it's really hard work, at the end of the day, Marisa is doing this for the exact reasons why she went into the business. She wanted to help people in Buffalo have something they would really enjoy. For the most part, she gets booked for weddings, birthday parties, baby showers or bridal showers...all happy occasions. You really get to see just how much people love each other: whether it's a wedding where they are celebrating love, or a shower where they are celebrating the birth of a child, it's a celebration and they want to make it special. When they come to Marisa and they are so excited, it makes her excited that she gets to help them with their special day. One of the things that Marisa loves is putting that special touch into the table that she knows the couple or the party will appreciate, like, for example, finding sugar flowers for cupcakes that are an exact match to the flowers that will be in the bouquet or the arrangements. Something like that definitely pulls the dessert table into the entire event. It's the little minuscule details that really make a huge difference, and she knows that they will appreciate it. After the meeting, Marisa brainstorms a bunch of different ideas and sets up a Pinterest board where both parties can collaborate on it and add ideas and visuals. Visuals are the best way to communicate ideas, as sometimes it can be hard to describe something so particular as a color. After gathering all of her ideas, she will check in with you about a month out from the event, just to make sure that nothing has changed. At that point she pretty much has the design solidified. The day of the event, Marisa will drive around to each bakery and pick up the goodies, then drive to the venue and complete the set up. At the end of the night, she will also be there to do the tear down. Dessert tables for every event: Marisa is all about celebrating any happy occasion that you could think of. "We do a lot of weddings. We do weddings of all shapes and sizes. It doesn't matter who you are or who you are marrying, love is love." While weddings are their number one event, they also do birthday parties, corporate events, holiday parties, bridal and baby showers. Pretty much anything! If you're celebrating life and need a sweet ending, why not have a dessert table? They service the Buffalo, Rochester and Finger Lakes regions. What she listens to while she's creating: "I'm a BIG electronic dance music chick!" Marisa needs the heavy beats and the crazy music to keep her mojo up. Since most events take 2-3 hours to set up, the upbeat music helps her stay focused and high-energy. Delicious desserts don't have to be crazy expensive: "One of the biggest misconceptions about dessert tables is that, since you have a variety of desserts, it must cost a fortune. In reality, it's really reasonable." They do a lot of custom work, but when you compare the cost of hiring B Sweet Designs to put together a gorgeous dessert table for your event versus doing it yourself, it might even cost more if you DIY (and cause you more stress!) When you factor in the cost of servingware, all of the desserts, the time it takes to run around town picking up all of the desserts, bringing it to the venue and setting it up, and then breaking it all down at night, it is actually so much easier to leave the sweets to a professional. “It's my job to take a little bit of that extra worry off of people,” she says. Marisa is open and able to work with a wide variety of budgets. Book at least a year out: The further in advance that you book your event, the longer that Marisa will have time to plan and make your table the best that it can be! Also, dates can become reserved very quickly, so the earlier you book, the better! No themes are too wild: Be open and honest about what you are looking for. Marisa will make your wildest dessert table dreams come true. Leave your stress at the door: Marisa is here to take care of EVERYTHING when it comes to your dessert table. There is nothing to be worried about and she will always make sure that every single detail is perfect. Prepare for the extraordinary: No basic desserts here! Marisa loves to make each and every dessert table look beautiful and elegant, no matter what the colors and theme are. She even has gone as far as creating a completely new dessert that is totally unique to the event. Custom doughnuts, cookies and even truffles leave a long-lasting sweet impression on her events. Make sure to follow B Sweet Designs on Instagram to see the newest creations from Marisa, and contact her via phone at 716-445-6044, email at info.bsweetdesigns@gmail.com or her website to start chatting about the dessert table of your dreams!